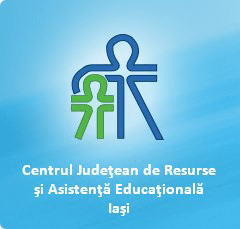 C.J.R.A.E.—The County Centre for Educational Resources and As-sistance of Lasi (Romania) offers specialized services of school me-diation and coordination, monitors and evaluates the services offered by its departments for an inclusive education and integra-tion of pupils, parents, community members. The purpose of our counselling services is based on ensuring a normal functioning of individuals and groups by promoting a healthy psychological well being, self development and prevention of risk behaviours. The final intervention of CJRAE specialists is the proper social integration of every individual and promoting a pro-active attitude towards own person and environment. The centre supports and encourages children, students, parents, teachers and other members of the local community in order to build a valuable life, stimulating the potential of every person for a better integration in school, career and in social life. CJRAE is coor-dinating, monitoring and evaluating several departments such as: Speech Therapy Centre, County Centre for Counselling and Educa-tional Assistance, Career and School Orientation Services for chil-dren and youngsters with special educational needs. The centre operates with 97 employees, the network of offices for counselling and assistance covering 90% of the urban area of the county and 25% of the rural area (76 offices). For speech therapy there are 19 specialists working in the centre, each of them covering an area containing at least 1000 pupils (4-6 schools). The main aims of CJRAE are: inclusion of all children/students/youngsters in the educational system – regardless their particular problems in social or personal area; insuring support and sustaining quality education, adapted to the potential of every student; in-forming and counselling for parents and teachers in the spirit of personal mental change and improvement of their educational ser-vices; creation and sustaining of optimal conditions for proper growth in students personality for a better integration in school, career and social life; involving parents in sustaining the relation-ship between family-school-community.